You know how the story goes: you’re looking into a new phone/utility provider and the salesperson is the most attentive person in the world. Friendly, helpful, available — you’re sure you’re making the right decision. And then you buy the product and run into an issue. Suddenly you’re met with automated answering machines and lulling hold music. This is an example of a bad customer journey. And if you were to visualize it, it would look a little something like a stock market crash. Will you want to use this company’s services again? Nope. Will you recommend them to a friend? No way. After you finally walk away from the terrible experience, you might receive a barrage of sales-ey emails trying to entice you to come back. As if. These situations are examples of poor post-sale treatment, and you can see how they’re terrible for business. But fixing these kinds of problems is easier said than done. Taking an objective look at your own processes is — understandably! — difficult, which is why many organizations give up and turn to external agencies for guidance. If you’re struggling to resolve these types of experiences within your own business, boy do we have a tool for you: customer journey maps. The truth of the matter is that with a little preparation, your customer journey maps can help you identify and resolve all types of problems without wasting resources. So without further ado, we’re going to demystify the process and walk you through it from beginning to end. You’ll soon see there’s no reason to let this diagram intimidate you. What is a customer journey map, and why do you need one? A customer journey map is a visualization of the customer’s end-to-end experience — from that initial ‘hello’ to the sale and beyond. It visualizes the thoughts, feelings, wants, and goals of your customers at each touch point of the journey. With this information laid out, you can systematically tailor your marketing around each point in the journey, ensuring your messaging is timely and relevant. In return, your audience is more likely to subscribe, buy, share and generally be receptive to you and your offerings. Some people will immediately start overcomplicating their map until the process itself becomes too overwhelming to complete. Why? 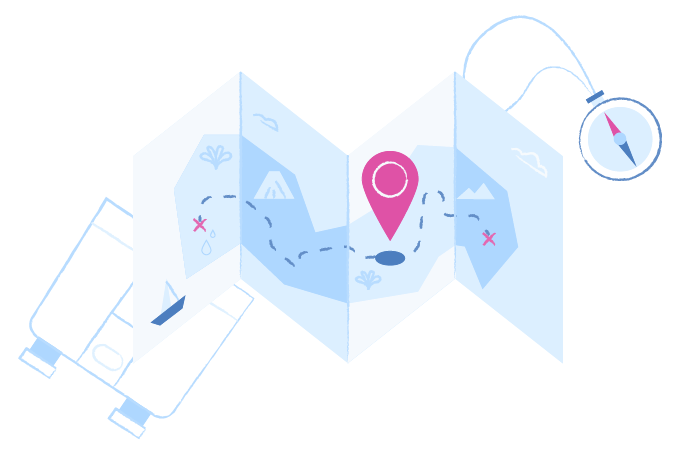 They think they have to map every single, teeny, tiny element of every customer’s journey. But let’s face it, that’s both impossible and unhelpful. Instead, it’s better to think of your map as a kind of portrait of your typical key customers. Except instead of creating general personality traits, you’re mapping out general decisions they make and the emotions they have along the purchasing process. Sure, not every single customer journey will follow the route you create. But the vast majority of customers will behave similarly, and with the right attention, you’ll be serving those customers really well. Who is it for, and how can it help them? The customer journey map is useful for several groups within an organization. It helps copywriters tailor their messaging to better reflect the customers’ needs and journey-related questions. It also helps the marketing team plan their schedule, so they send useful emails out at relevant times. You wouldn’t want to bombard your customer with ads for products or services they already have (*cough* Amazon *cough*). Similarly, you don’t want to inundate someone’s inbox with aggressive ‘buy now’ emails, when a gentle invitation to sign up to the newsletter or check out the YouTube channel may be more appropriate. And for the UX designer, a good customer journey map can help inform their design of the website or app, making sure the conversion funnel seamlessly carries the visitor from the homepage to call-to-action. Creating an effective customer journey map can be broken up into two steps: conducting a little research and setting goals. In understanding your customer journey, you want to dig into each high-point and pitfall along the way. Remember, the goal here is to put yourself in your customer’s shoes. You want to not only entice them to use your product or service but to leave them feeling more confident and secure than they did without you. There are two types of research that can help you do this: analytical and anecdotal. Website analytics is a way to figure out how people use your website. Remember though, it’s easy to misread the results. A long time spent on a page doesn’t necessarily mean they’re enjoying whatever it is they’re reading or buying; they could be stuck or frustrated. Social media also has a whole load of analytical tools you can use to find out more about customers’ habits. Voice of Customer (VOC) feedback such as surveys, interviews, focus groups, and workshops are another great way to get information from your users. What do you want your journey map to achieve? And how will you achieve those goals? Chat with other people within the organization (senior management, customer services, analytics-analyzers, and even customers, if possible) and define your customer journey map goals so you’re all on the same page. There are two types of customer journey maps, those that focus purely on touchpoints and those define the specific experiences of each touchpoint. The latter is more detailed and therefore more useful. It’s important to spend the time to flesh out these details if you want to get the most out of this exercise. The types of touchpoints will vary depending on your business or organization. For example, the below sections are totally relevant for, say, a clothes shop, but not so useful for a university looking to recruit students. Once you’ve figured out your key journey stages, you’re going to identify the key experiences for each touchpoint. This next bit is where you get to use all that customer data you gathered. Remember, this will be different across your key customer types. Objectives: what does the user want at this particular stage? Questions: what do they want to know? Behaviors: how is the user interacting with you at this point? Emotions: how are they feeling at this stage? Weaknesses and strengths: how has the organization let the user down? Helped them? Influences: What will shape the user’s decision at this stage? Next, you need to put all your findings in a layered diagram. You can use a grid, a timeline, an infographic, a flowchart… the choice really is yours. But just bear in mind that it should be neat, clutter-free, pared back (no one wants a novel in graph-form!) and attractive. It could even be a storyboard, video, or short film if you want. So long as it’s easy to understand and tells the story that focuses on the customer’s needs, then you’re onto a winner. Check out these awesome examples for inspiration. Assessments of the emotions your customers at specific stages or touchpoints in their journey. Measures of the importance of a specific touchpoint. Net Promoter Score (NPS) or other customer loyalty measures. The data you collect should reveal the health of your customers’ experience at each stage of the journey now and in the future. You can then use this to form actionable plans based on customer experience. Your journey map should be purposeful, actionable, and measurable. You’ll want to identify pain points in the user journey, but you’ll also want a plan for ironing these out — including how much it’ll cost to fix these problems balanced against the value a more positive user experience will have for your business. Another key purpose of a customer journey map is to identify opportunities based on your customer’s experiences. Visualize the customer’s highs and lows in mood. This is helpful for both identifying stages of the journey that meet or don’t meet their expectations, and identifying opportunities for the future. And last but not least: to create a living customer journey map that you can collaborate on with your team, you may want to invest in some cloud-based diagramming software. That way, you can create and share crisp, clear customer journey maps with ease.